Higher Education, research cultures, academic profession, academic identities, academic mobility, knowledge production, globalisation; conferences; gender, feminist and queer theory; feminist and gender pedagogy; international development; international volunteering and voluntourism; ethnography, autoethnography, qualitative research; deconstruction, poststructuralist theory; India, South Africa, UK, US, France. Emily F. Henderson joined the Centre for Education Studies in 2015. Her research and approach to teaching are inherently international and interdisciplinary, and are influenced by her earlier studies in literature and modern languages and time spent working or studying abroad in Togo, France, Senegal and India. She has further connections with the US, having conducted PhD research there, and South Africa, based on an ESRC PhD Partnership with the University of the Free State. At Warwick, she is course leader for the new MA programme, 'Global Education and International Development', which was launched in 2017. Emily is co-investigator on a 5-year research study on gender and higher education in Haryana, India (funded by the Fair Chance Foundation), and is also Principal Investigator on 'In Two Places at Once', a project on the impact of caring responsibilities on academics' conference participation (funded by Warwick Research Development Fund and IAS). She is co-convenor of AMIN - Academic Mobilities and Immobilities Network, and co-convenor of the 'International Research and Researchers Network' for the Society for Research into Higher Education (SRHE), and member of the Governing Council for SRHE. At Warwick, Emily is the Centre for Education Studies representative for the International Development GRP, an affiliate of the Centre for the Study of Women and Gender, and a member of the Gender Taskforce. 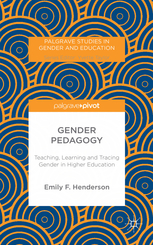 Emily is author of Gender Pedagogy: Teaching, Learning and Tracing Gender in Higher Education (Palgrave, 2015), and co-editor of Starting with Gender in International Higher Education Research (Routledge, forthcoming). She is also co-editing a special issue of Gender and Education, 'Thoughtful gatherings: gendering conferences as spaces of learning, knowledge production and community'. Emily is co-editor of the academic blog 'Conference Inference: Blogging the World of Conferences', which was launched in 2017 and is read in over 100 countries. In addition to this, Emily is currently working on publications that are based on her doctoral study on gender knowledge production at three Women's Studies conferences (UK, US, India). For full details of Emily's publications, see the link below. Emily holds a BA in English Literature and Modern Languages (French) from the University of Oxford, and an MA in Education, Gender and International Development, an MRes in Educational and Social Research and a PhD in Education from the UCL Institute of Education (MRes and PhD ESRC-funded). Xuemeng Cao, international students & employability, 2016-, full-time, funded by Chinese Scholarship Council, co-supervised with Ian Abbott. Roisin Ellison, counter-terrorism policy in schools & poststructuralism, 2016-, part-time, ESRC-funded, co-supervised with Judith Everington. Anjali Thomas, gender and higher education in Haryana India, 2017-, full-time, funded by WCPRS & Fair Chance Foundation, co-supervised with Ian Abbott. Johan de Kam, international expatriate experiences, 2017-, part-time, co-supervised with Stephanie Scnurr. English (native); French (fluent); Hindi (advanced); Urdu (intermediate); Ewe (basic).